Welcome to our October, 2017 Tried & True feature! Through this ever growing and revamped monthly product collection we are excited as ever to showcase some of the best innovative, classic, and top-quality skate gear across the industry—gear that we’ve tried ourselves and found to be true to quality skateboarding fun. This month we are stoked as hell to be focusing on the innovation behind the new Powell Peralta Flight Deck Construction, and their latest shaped decks built around it. Inhale, Exhale, and take flight; tune in below to see why Peralta has broken ground with this newest construction innovation! The construction of the Flight™ collection is unlike anything we’ve ever ridden, and we hope it’s here to stay. Looking at skateboarding as a whole, there are countless varieties of shapes and models, but it is rare that a complete innovation to construction, from the core up, creates something that can outperform, outlast, and ride better than a standard 7-ply maple or hardwood deck; yet here the Flight™ Deck Construction is! The skaters over at Powell Peralta set out over five years ago on a journey to improve strength and performance of skate decks and have applied their in-depth experience and knowledge into these Flight™ decks making a superior redesign to the standard board at a still affordable price point. Each Flight™ deck is created directly out of the Santa Barbara facility and they have taken nearly every design component in mind so as to provide a truly better skateboard deck. 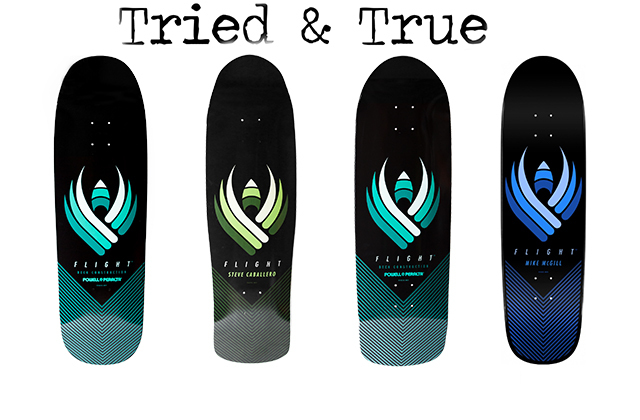 Putting our first Flight™ constructed deck to the test nearly a year ago, upon its release, we here at Wheelbase are blown away by its ride, strength, and overall quality. We have found the thinner design of the flight deck to specifically shave off weight, and create a board that is easier to grab during tricks, quicker to pump on, and with its lighter weight and resilient rebound these decks ollie higher, air fatter, and make flips flippier (yeah, we said that!). The epoxy infused, fiber reinforced core and top layer is stiffer, but actually provides a unique flex feeling that allows the tail to create a greater popping force, and most importantly will hold its pop far longer than its wooden counterpart. One session in on a Flight™, and you’ll realize how much further you can push the limits of your riding; we have also found the Flights to be highly durable in our riding, therefore, lasting much longer and taking on the heftiest tricks, session after session. If the riding proof isn’t enough, every Flight™ deck comes with a complete delam warranty for its useful lifetime and at a $90 price point, proves a value when lasting more than twice as long as a standard deck. 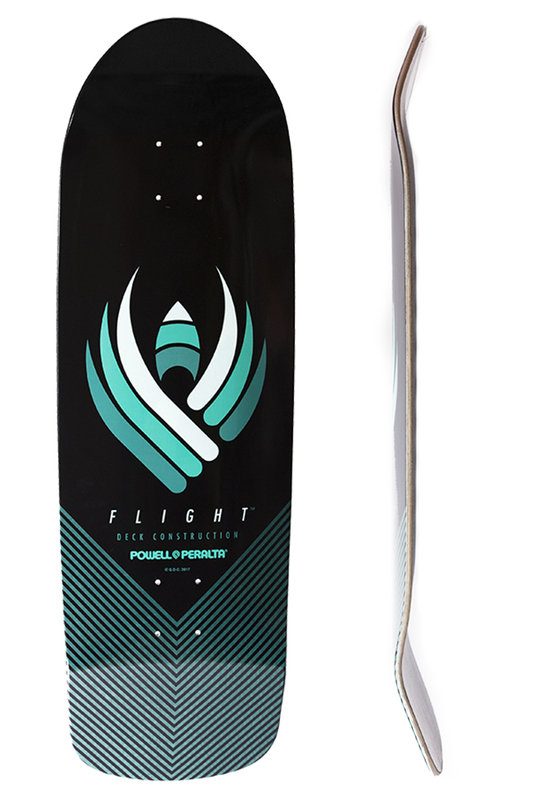 The FLIGHT™ Deck Construction Shape 192 by Powell Peralta is a wide and subtly directional shape tapered in a bit toward the tail (similar to the McGill, but more full and ish-squared) with the widest part of the deck pulled up near the front truck area. This deck is perfect for park, vert, and bowl ripping as well as ditch skating and sasiating that late-eighties street vibe. The overall width of this deck is 9.26” and the length is 32” with a healthy wheelbase of 14.75”. The tapered and rounded-square nose is 6.56” and is simmiler to it’s less tapered, and more full rounded-square tail of 6.56”. 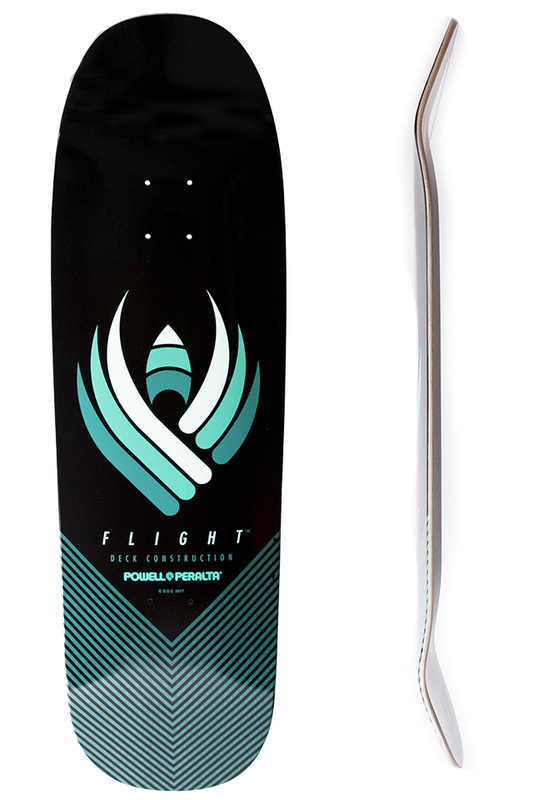 The 192 FLIGHT deck also features Powell’s K15 concave. We set this puppy up with Indy 169s and some 58mm Bones Wheels. ¼ risers were mandatory. Did we mention that we fully back this shape and FLIGHT construction? Well, we fully do, homies! Now ya know! That said, we hit the parks with this 192 Flight deck shape, and the fiber top-layer along with the thin, five ply construction sealed together with infused epoxy added up to unpresedented resilience in wear, lasting rebound while pumping and landing airs, sustained pop every pop, and overall solid board feel. We’ve heard that some skaters have mentioned somewhat of a learning-curve in getting used to this new construction and getting comfortable with the the way it feels, but we did not have those issues at all. The construction feels slightly different and thinner overall, but it skates like a skateboard. It’s a skateboard. We skated it. Ha ha! Anyway, if you are looking for the best deck construction available and a great pool/vert shape—or if you are like us here at Wheelbase and you hit the streets and hills on wider, shaped boards—then this is the absolute perfect board for you. Seriously, you gotta try one of these puppies! Grab a Shape 192 Here! The FLIGHT™ Deck Construction Steve Caballero board by Powell Peralta is one of the latest and first pro-model boards to feature flight construction; as Steve Caballero’s pro board it comes in at 31.9″ long, 9″ wide, and with a moderate 15.25″ wheelbase. The Cab gets its unique feel from its 6.2″ scoop nose, 6.26″ generous block-styled tail, and the unique concave that raises substantially along the rails to lock in with the nose and tail, but actually feels to flatten out along the center platform. 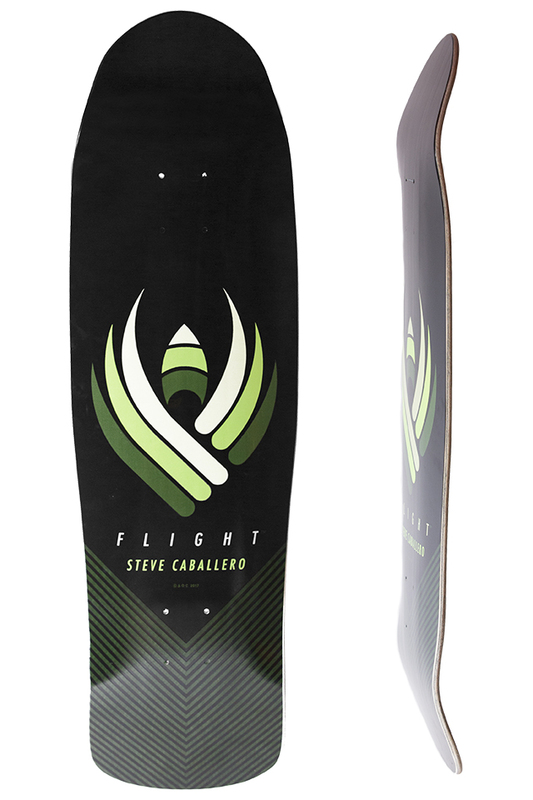 As stated above, with all the flight decks there is a very unique construction unlike anything we’ve ever ridden; the cab has a very stiff and sturdy feel but under pressure of tricks actually provides a slight flex feel that adds to the pop and responsiveness of the entire setup. The deck itself is lighter and easier to handle specifically in faster transition riding and the thinner shape lends it for better handling on grab tricks. We’ve found our cab to be at home in our pool riding, but will say that it has performed exceptionally throughout other transition, tricks, and feels damn good to rip on just about anything, especially when ollies or airs are involved. Hip boosts feel insane! We fully back Steve Caballero and the rider input and design that has brought this shape to life. Check out what Cab himself has to say on the construction here! The FLIGHT™ Deck Construction Shape 280 board by Powell Peralta is a 9.7″ wide beast with a classic directional build, block tail and stubby scoop nose – this fatty has some shape! At its 31.32″ length, 9.7″ width and 15.38″ wheelbase it is one solid setup that we have pushed through all terrains, favored especially in some deep-end pool action! The 6.7″ tail has no taper and therefore provides a very wide platform with a unique pop, while the slightly shorter 5.05″ stub nose is steep enough to lock in that front foot through all sorts of radical maneuvers. Previously we had been rocking a 10″ wide 7-ply maple tank of a deck and love the size setup with some 215mm trucks, but the Flight construction behind this shape has allowed us that same large platform with a much lighter ride and greater pop to it. Watch homie’s faces light up as they see this fatty pop over that hip, pool coping or what have you! We have been stoked on the Flight construction since day one of ripping on the 8.25″ popsicle, but this Shape 280 has finally brought us the same killer build in a much fatter option for those of us that appreciate some added width. This 9.7 proves over any other shape that the flight construction isn’t a popsicle gimmick or something already in existence, this construction is put to work in all sizes and pops just the same! Grab one today, and get that fatty shaped style going! More on the Shape 280 here. 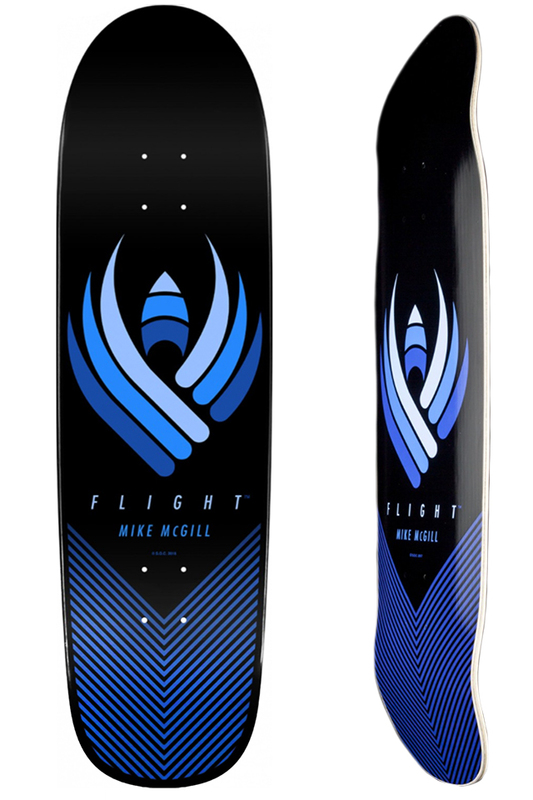 The FLIGHT™ Deck Construction Mike McGill board by Powell Peralta is Mike’s custom shape designed by the Bones Brigade legend himself (inventor of the McTwist), and is built for ripping vert and bowls. The width of this deck 8.97 and tapers-in ever so slightly just above the tail. The overall length of this FLIGHT deck is 32.38” with an ample wheelbase of 14.6”. The nose is rounded like a spoon and feels slightly shorter than most decks, with its overall length being 6.5”. The tail of this board is 6.75” in length, and due to it’s slight tapering yet slightly squared shape, it has great pop and also feels solidly controllable when slapping it around on pool coping. The deck features Powell’s K15 concave which is fairly steep yet comfortable overall. We set this deck up with Indy 159s (inserted 2 extra washers on the inside of each side of the axles for optimal wheel to deck edge seating. Sorry we jank!) and some 55mm Ricta wheels. No risers. Slight wheelbite. No problem. We love this shape and construction! The fiber-topped, thin five-ply epoxy infused maple build of this deck matched with it’s fully functional, directional shape is a match made for many, multiple hours of serious quality skateboarding. Although this deck’s intended purpose is for parks and bowls, we mostly skated the streets and some DIY with it. After numerous weeks of riding curbs, rails, banks, some parks, gaps, ledges, and manual pads this deck has yet to chip at all, or lose any pop. This contruction of this deck is like no other. Beastmode resilience! That said, the tail is wearing a bit like a traditional 7-ply, but it’s got many weeks of ripping left in it for sure. Overall, we are fully stoked on this shape and utterly impressed on the FLIGHT construction. See what Mike has to say on it himself here! Thanks for tuning in to our October, 2017 edition of Tried & True and reading up on this Flight goodness that has us stoked! Hit us up in the comments below if you have any additional questions or inout on the flight series yourself. Be sure to check back next month for another collection and fresh skate related products! Stay shreddy wheelbase fam!